About Us | Benchmark Woodworks Co. Benchmark Woodworks Company is a manufacturer and supplier of custom millwork, casework and fixtures for commercial and retail environments. We provide our customers with products built to meet their unique design and material specifications utilizing hardwoods, veneers, laminates, and shop applied finishes. We service retail companies, restaurants and contractors on a national scale from our central Ohio location. The company was founded in 1983 and occupies a 45,000 square foot manufacturing facility in Delaware, Ohio. At Benchmark Woodworks we understand the impact of top quality millwork on the overall project, as well as the urgency of project schedules. Our project managers excel in coordinating all the elements of a millwork package to provide our customers with a seamless project. Benchmark is a supplier you can depend on for your complete millwork requirements. Contact us through this website or phone us to have our sales staff get in touch with you for your specific needs. At Benchmark Woodworks Company our Engineering Department is fully staffed with qualified engineers, and detailers. 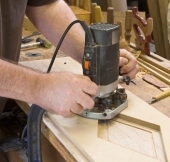 With an average of 15 years experience per person in the store fixture/millwork industry, Benchmark Woodworks engineers are qualified to fulfill our clients’ design requirements. Whether the client’s initial drawing is a conceptual sketch or a detailed drawing, our engineering department develops a complete set of CAD production drawings for client approval prior to production. After drawing approval, a bill of materials is developed and CAD drawings are converted to CNC code for our panel processing equipment. From estimating a job through engineering, production, finishing, delivery and installation, our project managers follow a job through the entire process ensuring that specifications are being met. The project manager is the primary point of communication between customer and shop, and is responsible to ensure that we are meeting our customers’ expectations. When you work with Benchmark we want to be more than just another vendor. We value the relationships that we establish with our clients and we work together to help make their projects successful. Sometimes a client has a need for budgetary estimates in order to explore the viability of a project, while at other times the need is for a detailed scope list and bid. Whether it be pricing, or production of a prototype, our desire is to assist in any way possible to win with our customers. In order to meet our clients’ unique needs Benchmark Woodworks Company has a large, well equipped facility. Our shop uses CNC manufacturing equipment as well as traditional wood working machines, and contains ample spaces for assembly and finishing. Our craftsmen work through the entire production process including precise machining, careful assembly and expertly applied finishes. It’s what we do - and we are certain that you will be pleased with the results.